"Openwave's Integra web service sits in the data stream between the end user and the 3rd party web apps. It evaluates the relevance rules defined by the app against user data supplied by the network such as the user's unique id, location, rate plan and roaming status. The user data is not shared with the apps and user must ot-in to the program and can define which sites the toolbar appears on. The service is designed to be cross platform and cross browser but initially will only support the HTC Epic and EVO. How much is a share on Facebook or Twitter worth? P.S. you can see links from social networks (Facebook, Twitter) for any site with Social Links mashup. Our mashup for Facebook - Social Graph Directory has been updated. Lets you present public info from the social graph in the simple tabular form: where my friends are working, where do they live etc. For example, you can easily find contacts within some company – present your Facebook circle like Linkedin directory etc. 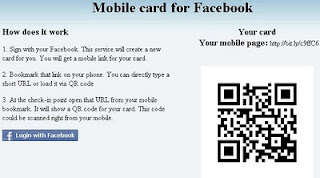 Our mashup Mobile Facebook ID card has been updated. 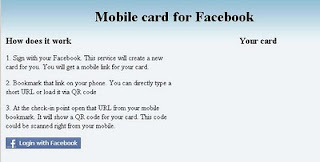 It lets you create mobile identification card with your Facebook ID. This mashup lets you create mobile web page with QR code that presents your name and photo from Facebook. You can present (show) this QR code (mobile page) on the some check-in point, QR code could be scanned right from your phone and your ID could be checked. 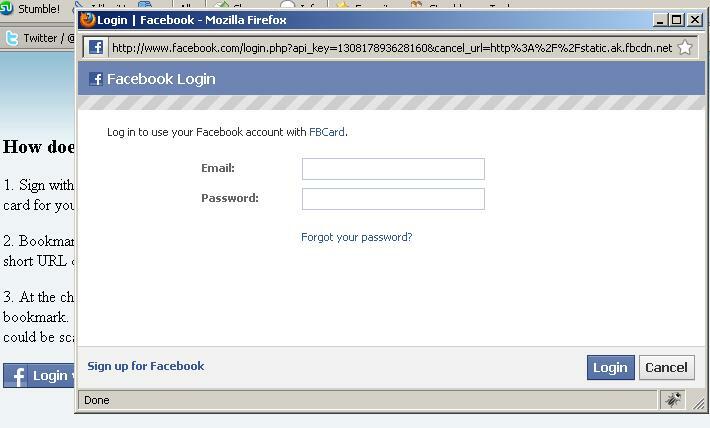 You can see screenshots for the process here: how to confirm your identity with Facebook. "There are tools that make our lives much easier. In this post, you’ll find an overview of useful and handy tools that can help you increase your productivity and improve your workflow. Some tools are more general, the others are more technical" - a great collection of tools. Our mashup Checkins has been updated. Lets you see real-time checkins from Twitter with geo-coding turned on. In other words it will show only geo-coded twits. Bad news, but SMS URI implementation for Android is completely broken (Desire, Android 2.1, Android 2.2). Really not a good news for mobile web developers. No words from Google when and why. 'The query 'Where are you now?' is the most commonly sent SMS message, texted over 600 billion times per year in the US. A new webapp called Where are you now? 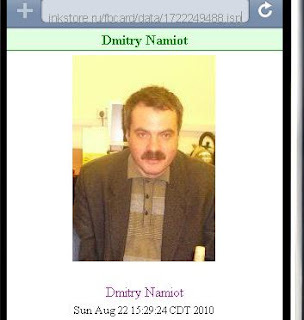 (WAYN) from Dmitry Namiot (Geo Mail, Geo SMS, Mobile Share) automates the asking and answering of that question.' - our mashup WAYN on Wapreview portal. You can move map (walk in) from one tip to another. So with this tool you can place on your own site (blog etc.) – e.g. somewhere in Contacts or About pages QR code for any given address (e.g. address of your company, office etc.). And any visitor of your site will be able simply to scan this code and load that map right into own phone. So they (visitors) do not need to write/print/remember your address/driving directions anymore. He/she can just load an appropriate mobile map right from your site. Loaded map could be simply bookmarked on the phone (loaded map is just URL). Of course, QR code created with this mashup could be placed anywhere. E.g. add it to some article in your blog, print and place it on the wall etc. Also QR – code is just a view that simplify loading of some mobile-friendly URL with map. Actually mashups creates at the first hand that URL and after that creates QR-code for it. So you can publish in your blog a mobile-friendly URL too. Your mobile readers will be able to open that URL directly. QR map - lets you create QR code right from the map. This mashup also can create a link to mobile friendly map (iPhone, Android). Tips - lets you copy address data right from social recommendations (Foursquare). Does this site exist? How to check this from your JSP (and/or Coldfusion) code - JSON HEAD servlet. A proxy for your Ajax requests lets you bypass sandbox restrictions. Rather than let social network monitor your location (Google Latitude) or share your location info within some social circle (Foursquare check-in etc.) Geo Messages approach lets you share location data on the peer to peer basic. You can share your location info just as a signature to the standard messaging (email, SMS). And what is important – shared location data (map) does not contain your identity. Your ID (name, phone) is in your email (SMS) only. The shared map does not reveal anything about the author. By the same principles you can also share location info with your Twitter and/or Facebook friends. The latest update includes Where are you now mashup too. It lets you request location info by email. Among social networking sites, Facebook is by far the most preferred service for sharing, making up more than 78% of usage. Yet other sites are gaining: Twitter maintains 5% of referrals, and MySpace, surprisingly, comes in at second with 14.5% share. Yet Twitter has become the most effective tool for click-throughs. Twitter yielded a whopping average of 19.04 clicks, whereas Facebook only produced 2.87 clicks. 7 times better. - from here. And yes, the open structure of Twitter graph lets easily implement some tools for links extracting. E.g. Links from Twitter or Lists from Twitter Both mashups let you find interesting links in Twitter. It is the most popular question in the mobile messaging. 600 billion per yer - more than impressive digit. For servicing such kind of requests we offer Geo Messages approach. It introduces a new way for sharing location info data in mobile networks. This approach could be used as a base for many mobile services. You can find many of them on Geo Messages page. Let us describe a yet another service. We have a simple application Geo Mail. It lets users send mobile email with location info in the signature. It is mobile web application (HTML5), you do not need to install any code. It is enough to know service URL only (e.g. keep it in the bookmarks). It is exactly what our new mashup Where are you now is doing. P.S. You can use also an appropriate bookmarklet from our collection. It lets you get such information in one click only. "US operator AT&T is poised to announce the opening of three new offices focused on mobile apps development. In an interview with Bloomberg, AT&T’s CTO John Donovan said the operator will open new facilities in Palo Alto, California, Tel Aviv in Israel and Plano, Texas, that will work with software firms to develop mobile apps that it can offer on its network. Advertising support solution for JSP (and/or Coldfusion) - Ad rotator taglib. Lets you display banners (images) on your site. And for rotating text (code chunks) you can use Text rotate taglib. And what is this search site Eurip about? As per log on Coldbeans site it sends several times more customers than Yahoo for example. "Vodafone offers you 100% free access to the Vodafone Private Handset Cloud. This innovative service, powered by Perfecto Mobile's mobile application testing solutions, allows you to test your widgets, applications & content on REAL live Vodafone devices. The Vodafone Private Handset Cloud significantly evolved during recent months, to include new handsets and many exciting features that can really make life a whole lot easier for all you developers out there. The Vodafone Handset Cloud lets you test and monitor your apps on multiple devices, in various geographies and thus significantly shorten your application's approval process, testing costs and time to market- without ever needing to constantly buy new devices! With the launch of the new Vodafone Developers website we thought it could be a good opportunity to invite all of you - existing and new developers - to check out (for free!) the service and see how it can help you." Our mashup Buzz from Twitter has been updated. Let you see buzz words from any Twitter timeline. In other words you can see topics marked by the friends of any particular user in Twitter. A good way to pickup current trending stuff from users you are interested in. You do not need to be authorized in Twitter for getting this info. Actually you do not need to own a Twitter account even. For your JSP (and/or Coldfusion pages): Digg button. An updated custom taglib from Coldtags suite lets you add Digg button to your pages. A good (and free!) collection of books devoted to Machine Learning. See also similar resources here. Our directory of mashups has ben updated. See it here. Our mashup Links from Twitter has been updated. Lets you see links published in Twritter by the friends of any user. E.g. check out what Twitter’s CEO is reading (or, at least, is seeing) etc. Sometimes it could be a good source of information for you. Read Twitter through somebody else view. 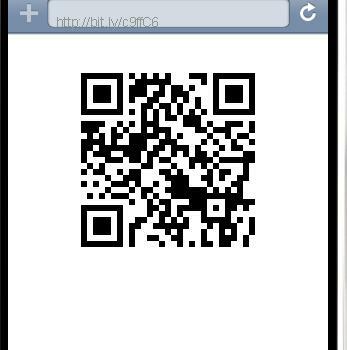 Open source library that provides barcode API (including QR code) for Java. A huge list of supported formats: UPC-A, UPC-E, EAN-8, EAN-13, Code 39, Code 93, Code 128, QR Code, ITF, Codabar, RSS-14, Data Matrix. Here you can find programming examples. Our mashup Social links has been updated. Lets you see links from social networks (Facebook, Twitter) for any site. A puzzle from Facebook image profile: Restore the facebooker. Just set user ID, name or any Facebook related URL and get a puzzle created from user's profile. Time killer for Facebook fans. Here is a public list in Twitter about mobile services. You can get also hot links from there via our Twitter lists mashup. Our mashup Retweets from Twitter has been updated. Lets you see retweeted statuses (messages) from any timeline. It is a good way to discover the interesting topics from Twitter. W3G conference - LBS business. 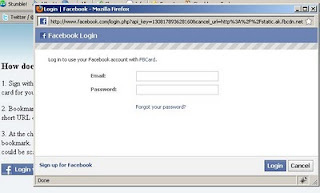 A custom JSP taglib lets you deal with Facebook ID and profiles - Facebook ID taglib. And ID servlet simply lets you obtain unique ID from your own server via JSON or JSONP. Coldtags suite ver. 4.0 is ready. This suite contains 400+ custom JSP tags for the most common tasks faced by JSP (and/or Coldfusion) developers. See here this largest collection of JEE web controls. Launch48 organizes interactive and innovative events for people from a range of professional backgrounds. The event help participants to create successful online businesses using the web or mobile. Here is London, Sep 2010. Custom JSP tags library for mobile developers. Lets you obtain geo coordinates for the given Cell ID. Cell ID is the unique number of a GSM cell for a given operator. Any phone is always connected to some cell, and by knowing this number, you know the Cell, and by knowing the position of the cell, you know where your phone is. There are some accuracy issues, as the cell can cover from several hundreds of meters to several kilometers, but this could be a very good starting point to locate the phone. Tag lets you obtain location data via Ericsson labs mobile location API - Mobile location taglib. A new component in our Coldtags suite - Client ID taglib. Lets you assign an unique ID for the each client. E.g. in your mobile web applications set an unique flag for the each client. Our mashup Dialogues in Twitter has been updated. Lets you restore the chain of tweets related to the given status (message). The use cases are obvious. You are reading some tweet with the question and also interested in the answers. Or, vice versa, you are reading some answer and need to restore the dialog from the beginning. You can also simplify your actions and deploy an appropriate bookmarklet (Dialogues in Twitter) from our collection. In this case on the opened web page with the status (message from Twitter) just select a previously saved bookmark. JavaOne 2010 - the first one without Sun by the way. Geo Location conference SMWGeo (CA, US). 1.They provide a web based API using which users can call telephony applications like dial, get dtmf, record audio, play audio etc. 2.They take care of hardware setup and phone number provisioning so that you can worry only about your application. 3.Most of them have a pay for what you use policy so the initial setup costs are negligent. From here. CloudUSB - a USB key containing your operating environment and your data + a protected folder so nobody can access you data, even if you lost the key + a backup program which keeps a copy of your data on an online disk, with double password protection. Geat idea! Our mashup Links from Twitter has been updated. Added filtering (e.g. clear geo statuses), improved pictures processing. Mashup lets you set a name for Twitter account and get all the links from his/her friends. All the links published in the given Twitter’s circle. You do not need to authorize, you do not need to have a twitter account even. There is definitely something going wrong at dailyrazor.com hosting we are currently on. This month we are experiencing 24 hours breaks in the service. Are they dying? Btw, recommendations for the good/reliable Java hosting are welcome. Our mashup Twitter info has been updated. It lets you pickup from the social graph other resources, associated with the given twitter account. It is a dead simple way to discover who is your new follower and who you to follow to in Twitter. In particularly, now you can pickup also the performance metrics, account age and other stat info. Our mashup Lists in Twitter has been updated. Lets you collect the keywords (discussed topics) and top links from any Twitter list. Facebook offers for web sites a plugin that shows the popular links (by Facebook’s crowd) from that site. So site owner can place that plugin right on the site and visitors will see what is popular. Our collection of bookmarklets has been updated. In particular, check out for example a new bookmarklet for our Social Links mashup. 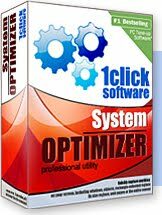 A new useful suite from Digeus: System Optimizer. It is a pack of applications (Disk Space Analyzer, Duplicate Files Finder, Junk Files Cleaner, Memory Cleaner etc. - a really huge list) provides the smartest way to solve computer problems and protect your valuable data. Sure, many of the applications exist in the free forms, but the well assembled pack of working utilities worth own money. It is definitely easy to use. Our new web application for Facebook - Social Graph Directory. Lets you present public info from the social graph in the simple tabular form: where my friends are working, where do they live etc. P.S. and Facebook API is really fast. Impressed. "Most checkin apps are designed so that small businesses can set up specials or rewards for checkin activity. Few, however, can truly verify that an application user is exactly where they say they are. For the small business owner to truly benefit from offering checkin rewards, verification is critical." - from here. 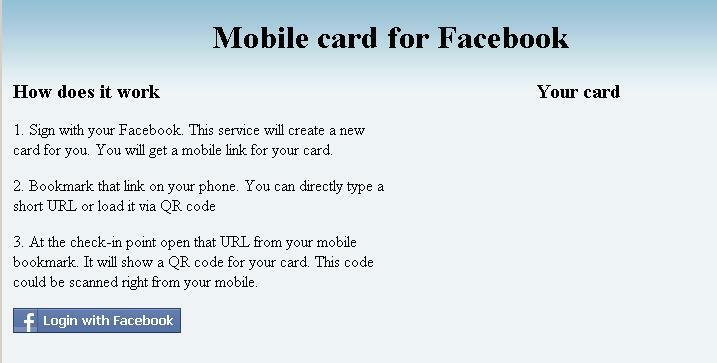 It is exactly what our Mobile ID card for Facebook is about! Custom JSP taglib lets you tag resources right from your JSP (and/or Coldfusion pages: Del.icio taglib. And Bookmark taglib lets you create links for bookmarking. Due to huge problems with disks sub-systems in our hosting provider, most of our mashups (hosted on linkstore.ru) are down at this moment. We apologize and hope to restore services soon. P.S. btw, there is a useful trick with mobile email. You can send email message not only to some person, but to service too. For example, Facebook lets you update status info by email (see http://www.facebook.com/mobile regarding service email for your account). If you send status mail via Geo Mail mashup than you can share your location info with your Facebook social graph. Yet another implementation for Places. You can use mashup directly or via an appropriate bookmarklet from our collection. Many modern blog platforms (most of them actually) let you publish data by email. You can just send an email to some service address and platform transforms it into a new post. For example, in Posterous you can send data to post@your_blog.posterours.com, in Friendfeed it is share@friendfeed.com, in Blogger you can set address in Settings->Email&Mobile tab, Facebook can update status by email too (see http://www.facebook.com/mobile/) etc. Mashup Geo Post helps you add location info to such emails. All you need is set an email address for update and get back a customized version of Mobile map mashup, that lets you send email updates to the provided address. 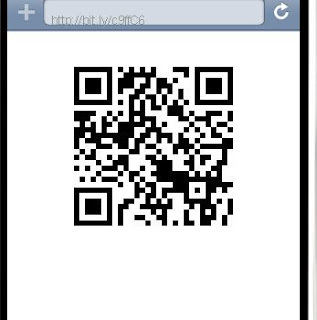 Simply save short URL provided by GeoPost mashup in your mobile browser bookmarks or load it via generated QR code. "Two services break from each other – and in a non-trivial way – is in their respective distribution strategies. Google relies on Search. Facebook relies on Social." - from here. P.S. and Geo Messages are all about peer to peer. Telecom way vs. Internet approach.